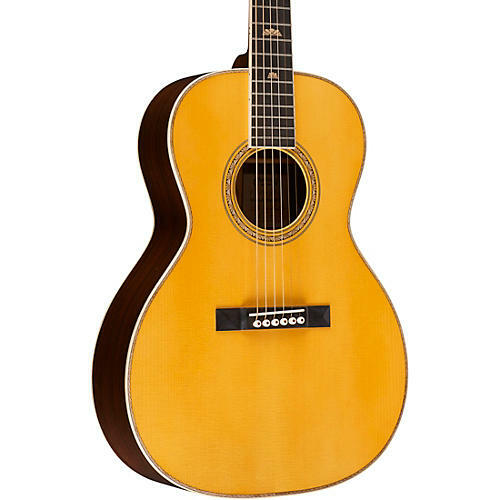 The SS-00LArt Deco-2017 Limited Edition Acoustic Guitar is a unique 14 Fret slope shoulder 00L guitar, limited to a run of only guitars, shown originally at Summer NAMM. Each 2017 Special Grand Concert has a custom paper label signed by C.F. Martin IV and is the same size and shape as the popular CEO-7 model. The SS-00LArt Deco-2017 features a design motif in collaboration with luthier Bruce Petros in the form of wood purfling that extends around the top, back and fingerboard. The purfling is laser-cut from beautiful flamed maple. The top is Adirondack spruce with an antique toner and the guitar is further complimented with open gear Schaller Grandtune vintage copper tuners.